Mandy and Sid have been looking for the right home. They know the specific school boundary that they want to live in, but homes in their price range aren’t exactly what they have in mind. 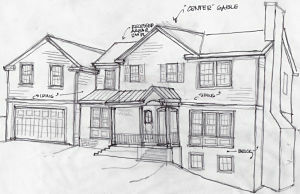 To build, or not to build onto an existing home? So they are thinking about buying a smaller home that they can improve to meet their needs. They want their home to have at least 2,500 sf of living area, plus a 2-car garage, and a large family room. But homes of that size and characteristics are over their budget. Instead, they are wondering if it makes sense to buy a small, 1950’s rambler on a good-size lot that is for sale and turn it onto their “dream home”. They’d like to either build a new home from scratch or use the existing foundation and add on to the footprint, plus add a second story. What goes into improving an existing home or building a new home? To keep it simple, a purchaser would buy a small home in a large-enough lot, hire a builder to design and build the new home, and after a few months, move into their dream home. How much would a dream home cost? Well, it depends on the cost of the builder, and it depends on the extent of the construction. But the least that I’ve seen spent on a serious improvement of a home is about $300k, and it can easily cost over $600k. Construction costs vary significantly depending on the materials used, the scope of construction, and the builder’s fees. They would add at least $300k to improve it, and the total cost turns to be about $800k. However, their budget is $700k. Unless they can buy the rambler for much less, or reduce the scope of the addition significantly, building is outside their budget. But let’s say that Mandy and Sid were O.K. with a smaller addition that keeps them on budget… what else should they be focusing on? These two restrictions are very important to know before purchasing a home for improvement. For example, if Mandy and Sid want to add a 2-car garage, they must make sure that the addition will fit within the lot’s “setbacks” (i.e. the open space that must exist between the house and the lot line). Let’s say that Mandy and Sid also want to add a big family room and a kitchen addition to the back of the home. The available space behind the home must be large enough to accommodate the addition itself, but the overall lot will also have to be large enough to allow for the proportion of the total building area to the lot size within the zoning guidelines (this means that many zoning regulations don’t allow huge buildings that leave very little yard left). 1. Before making an offer on a home that you hope to improve, you’ll want to do some research at the County offices to find out about the specific restrictions for the lot. 2. You should also have a trusted builder “on call” to give you their opinion of how much they believe it will cost to build the space you want on each of the homes that you are considering. Ideally, you would have discussed at length what you are hoping for so you are on the same page. 3. Think about where you will live while you’re waiting on construction. It could be several months from closing until the date that you can move in, so you’ll want to plan for that too. In the end, Mandy and Sid found a beautiful home inside their favorite school boundary – and it didn’t require major improvement. They felt that the space was adequate and even though it wasn’t the home of their dreams, the price was right and the convenience of not having to deal with a massive remodel was a big plus to them. 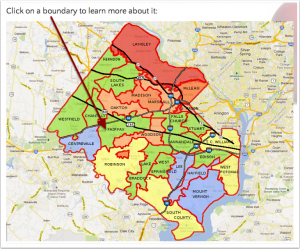 See what kinds of homes are available within your budget by selecting a school boundary from the Fairfax County Map. Once on the boundary page, click on the red button to access the home search app. 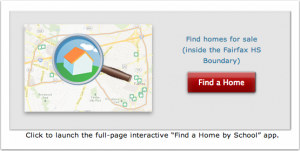 Start searching for homes on the Fairfax County Map.